At least eight people have died and dozens have been hurt in a tour bus crash in Yucaipa, Calif., which occurred the evening of Feb. 3. According to a Feb. 4 KTLA news report, the out-of-control bus rear-ended a car, struck a pickup truck and then rolled over ejecting several bus passengers. While this is an incident still under investigation, it is important that injured victims and families of deceased victims get the crucial support they need during such time. Eight people were killed and many others were injured after a tour bus went out of control and crashed on a mountain road near Yucaipa in Riverside County. According to a Feb. 4 KTLA news report, the fatal bus crash occurred the evening of Feb. 3 on State Route 38 north of Yucaipa and below Forest Falls. The report states that the tour bus rear-ended a sedan, crashed with a pickup truck that was pulling a trailer, and then rolled over. At least 42 people were injured and eight died. Firefighters spent more than two hours extricating many of the victims from the twisted wreckage and some victims were ejected from the bus, the report states. California Highway Patrol officials described the accident to KTLA News as "one of the worst ones" they had seen in their careers. Officials with the National Transportation Safety Board (NTSB) are investigating the crash, but KTLA reports that the bus driver said the bus had problems while coming down the mountain. The report also has witnesses saying they saw smoke coming from the back of the bus and that it was going "very fast." The bus left Tijuana early Sunday and appeared to be heading back there from Big Bear. The bus is owned by Tijuana-based InterBus Tours, the report states. The company has travel packages from Tijuana to several Southern California attractions including Disneyland, Six Flags, Universal Studios, Knott's Berry Farm and area vineyards, the article says. While this is an incident still under investigation, it is important that injured victims and families of deceased victims get the crucial support they need during such times, said John Bisnar, founder of the Bisnar | Chase personal injury law firm. "It is critical that all injured victims, regardless of the extent of their injuries, seek and obtain medical treatment. 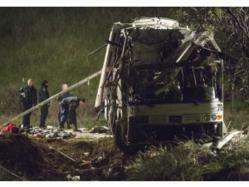 Some bus crash injuries do not even surface for days or weeks after the incident. Getting prompt medical attention will ensure that victims are on the path to recovery." Bisnar said he will be closely watching the results of the bus crash investigation. "In such cases, it is very important to pinpoint the cause of the crash. Was it caused by mechanical malfunction? Was the bus properly maintained? Was the driver speeding downhill? There are several questions that must be answered before arriving at a determination of fault. The investigation will help determine if it was driver error or mechanical malfunction such as brake failure." The California bus accident lawyers of Bisnar | Chase represent families that have lost loved ones as a result of negligence or wrongdoing. The firm has been featured on a number of popular media outlets including Newsweek, Fox, NBC, and ABC and is known for its passionate pursuit of results for their clients. Since 1978, Bisnar | Chase has recovered millions of dollars for seriously injured victims and families that have lost loved ones as a result of someone else's negligence. For more information, please call 800-561-4887 or visit http://www.bestattorney.com for a free consultation.